In Mizoram, PM Modi dedicated the 60-MW Tuirial hydropower power project, which makes it the third power-surplus state in the northeast, to Sikkim and Tripura. The project is expected to produce "251 million units" of electricity annually. Announced in 1998 by the then Atal Bihari Vajpayee government, it was the first major central government project to be successfully commissioned in Mizoram. Aizawl/Shillong: Prime Minister Narendra Modi on Saturday inaugurated crucial connectivity and power projects in Mizoram and Meghalaya to accelerate development in the northeastern states, a focus area of his government's Act East Policy. PM Modi was in the two states during his day-long visit to the northeast. In Mizoram, he dedicated the 60-MW Tuirial hydropower power project, which makes it the third power-surplus state in the northeast, to Sikkim and Tripura. The project is expected to produce "251 million units" of electricity annually. Announced in 1998 by the then Atal Bihari Vajpayee government, it was the first major central government project to be successfully commissioned in Mizoram. PM Modi said the dam for the project could also be used for improving connectivity in remote villages, fisheries, ecotourism and as a source of potable water in the region. In Meghalaya, the Prime Minister announced Rs 90,000 crore for improving roads and national highways in the northeast over the next two-three years to improve connectivity. He dedicated to the nation a 271-km two-lane national highway connecting Tura in western Meghalaya to the state capital Shillong. Addressing a public meeting in Mizoram's capital Aizawl, PM Modi said: "Today, we celebrate a significant milestone in the history of Mizoram with the completion and dedication of the 60-MW Tuirial hydropower project." He said the Act East Policy of his government would soon make Mizoram the gateway to the Southeast Asian countries, which include Cambodia, Myanmar and Vietnam. The 10 members of the Association of Southeast Asian Nations (ASEAN) include some of the world's fastest-growing economies like the Philippines and Vietnam, with growth rates of over 6 per cent. By 2020, the region is likely to have the world's fifth largest economy, according to the World Economic Forum. PM Modi said the Kaladan Multi-Modal Transit Transport Project, connecting Aizawl with the deepwater Sittwe Port in Myanmar, would provide great benefits to northeastern states. He said with the allocation of Rs 10,000 crore for the power sector, a state-of-the-art transmission system would be in place soon in the northeast. The development of the Rih-Tiddim road and the establishment of numerous rural "haat" (markets) along the Mizoram-Myanmar border would increase trade volume, PM Modi said. 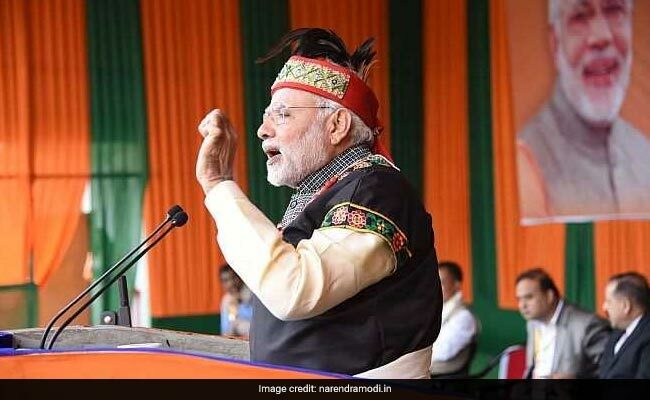 High literacy rate, presence of a large number of English-speaking people and good hospitality could transform Mizoram into a model tourist destination, PM Modi said, adding that the centre was committed to linking all the state capitals in the northeast through a rail network. Talking of infrastructure programmes, he said the centre has launched the North East Special Infrastructure Scheme (NESIS) to fill in the gaps. "The new scheme has been designed after due consultations with the state governments. However, to ensure continuity, all the ongoing projects under the Non Lapsable Central Pool of Resources (NLCPR) will be given funds for completion by March, 2022," he said, adding that the centre would provide Rs 5,300 crore to the northeastern states under the scheme over three years. Stating that poor connectivity is one of the biggest challenges in the development of the northeastern region, PM Modi said his government has sanctioned over 3,800 kms of national highway with an investment of Rs 32,000 crore in the past three years. Nearly 1,200kms of roads had been constructed, he said. The centre would invest another Rs 60,000 crore under the Special Accelerated Road Development Programme in the northeast and Rs 30,000 crore under the Bharatmala project over three years, PM Modi said. He also said the farmers in the northeast could now produce, transport and sell bamboo without any restrictions after the Centre relaxed the bamboo restriction regime. Bamboo, previously classified as tree, is now classified as grass to enable its cultivation for commercial purposes. Addressing a public gathering in Shillong, the Prime Minister highlighted the achievement of the NDA government and said: "In three and a half years, the Union government has released about Rs 470 crore to Meghalaya under the PMGSY for village connectivity and enabled construction of 700km road to connect 100 habitations." "This is three times the amount released during the four year period during 2010-2014 of the UPA government." On the expansion of Shillong airport, PM Modi said bigger planes like Boeing 737 and Airbus 320 should land in Shillong airport soon after the approval for its extension. "The Union government has given its approval for runway expansion of Shillong airport and we will spend Rs 180 crore in this regard and the project should be completed within one and half years," he said. He said the state also stands to benefit from the UDAN scheme, a regional airport development programme, under which Shillong will be connected with other cities in the region. Recalling his recent experience with a sea plane in Gujarat, PM Modi said sea planes could be an option for improving connectivity in the northeast.